Will Apple's iPad be able to keep its name in China? Will the iPad 3 end up being called the something-else-Pad when it debuts? The bigger question today: Will Apple be able to keep selling its tablet at all if, as it seems, doing so violates Chinese law? The initial answer: Probably not. 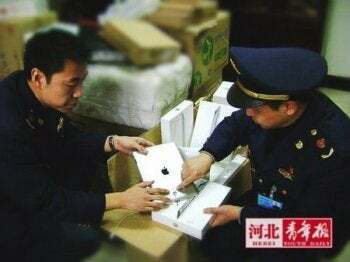 Reports indicate Chinese authorities are actively seizing iPads and confiscating them from sale. The news comes after a court in December rejected Apple's claim that Chinese company Proview Technology had violated Apple's trademark to the iPad name. Whether Apple actually owns the trademark in China remains unclear. Cupertino initially spent $55,000 to buy the European rights to the "iPad" trademark from Proview's parent company several years ago, but Proview maintains that it holds the right to the name "iPad" in China regardless. Proview's parent company registered the name "iPad" in several countries back in 2000, adding China to its trademark dossier in 2001. Apple's iPad didn't go on sale until April 3, 2010, of course, and Apple didn't began selling the iPad in China until September 17, 2010. By all accounts (and analyst commentary), Apple's in the wrong here, and could end up paying dearly for it — to the tune of 10 billion yuan (or about US$1.6 billion), if Proview has its way in court. Proview's not waiting, either: Chinese site Hebei Youth Daily broke the news on Monday that China's Trade and Industry department was actively confiscating Apple's iPads from store shelves because — after a complaint filed by Proview, and given the recent court ruling against Apple — the tablets are being sold in violation of Chinese trademark law. The seizures so far appear to be limited to Shijiazhuang, the capital of Hebei province, but a proview lawyer told the L.A. Times this is just the beginning: "You’ll likely see more and more actions across the country ... Apple did not follow Chinese law so we're confident the authorities will side with us." David versus Goliath? Perhaps. Taken at face value, Apple seems to be trampling on international trademark law here, assuming that its absorption of Proview's claim to the "iPad" name gave it rights to the Chinese one. What do you think, PCWorld readers — if Apple fails to settle with Proview and Chinese authorities bar the tablet from sale country-wide, what should Cupertino rename the Chinese version of its iPad? Matt Peckham writes for TIME and PCWorld. You can find him on Twitter, Facebook, or Google+, and follow Today@PCWorld on Twitter, too.